Who else is planning a summer road trip with kids? Summer is nearly over, which means you better hit the road quick if you want to avoid those unexcused absences. If you want to try to kick it old school style and have a technology-free road trip then you are gonna need to get creative. Kids today are not as easily distracted as those of us who grew up counting the roadside power poles from the back of a station wagon in the 80s. That means you need to make a plan and be prepared. 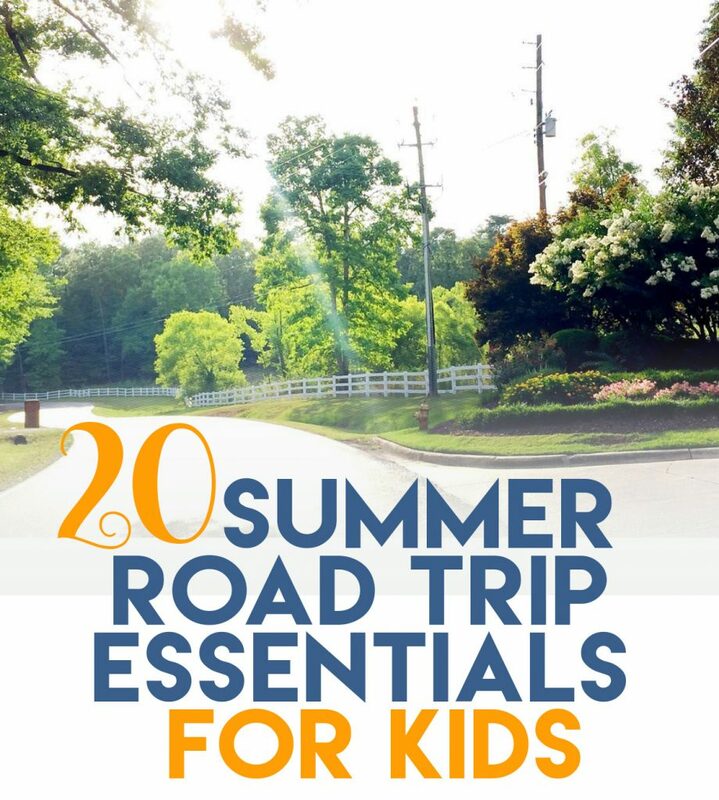 Here are my suggestions for 20 road trip essentials for kids. So, let’s start with games, games and more games. Here are four classic roadtrip games to get you started. Another old-school accessory you might want to consider? An atlas. We are so reliant on GPS these days, and this is the perfect opportunity to teach your kids how to navigate using a map. Get them to figure out your best routes to get to your destination. You might be changing their names to Siri when you see how efficient they can be. If all the games get boring, whip a pack of window clings out of your purse and let the kids go wild sticking them all over the windows and their foreheads. This will provide minutes (ok, seconds?) of entertainment. Boo-boos happen. Better safe than sorry! Your inner boy-scout will thank you for always being prepared for roadside emergencies. You never know when you might need this tool. Let’s hope it’s NEVER, but just in case…. Dude. This is the Daddy of the Macs of Coolers. Probably not necessary for a short trip, but if you’re driving cross-country, this might be worth the investment. Don’t let the dog pee on the sandwiches, Clark. Protect them inside this pretty insulated tote! For shorter road trips, toss in an ice pack and this will work just fine. Toss these in the freezer a few days before your trip and they will keep your refreshments chilled along the way. My Yeti travels with me everywhere I go. This sucker has seen more miles than my exercise bike, and that is a fact. It’s like a one-stop-shop for snacks! No more gas station prices, just fuel up all at once with this mega-snack pack. Just add some bottles of water and squeezy-fruit pouches and you’re good to go. Just take the whole case. You’re gonna need ’em. Every kid I know would love one of these cute neck pillows from Skip Hop. They are especially handy for the floppy-necked backseat sleepers of the world. What kid would not love to turn their backseat area into an airplane? This folding tray table holds all sorts of stuff- tablets, sippy cups, tiny toys… Just make sure they are locked in their full upright position before takeoffs and landings. You knew this was coming, right? You might think you want a technology-free road trip a la Greg Heffley’s mom, but you would be wrong. Everyone needs some kind of electronic distraction to pull out in the 11th hour when the whole backseat is whining and sad. This is your Ace-in-the-Hole. Use it wisely. Have a safe trip! See you next Fall. Great post, but we needed this at the beginning of summer as school is getting ready to start. I’ll be sure to recall this info on upcoming road trips…like your trip to see the sunflowers! ?